The 1996 Games were given a dramatic and emotional start when the cauldron was lit by sporting legend Muhammad Ali. However, on 27 July tragedy struck when a terrorist bomb exploded in the Centennial Olympic Park. Two people died and a further 110 people were injured. For the first time in Olympic history, all 197 recognised National Olympic Committees were represented at the Games. Beach volleyball, mountain biking, lightweight rowing and women's football made their first appearance and sailor Hubert Raudaschl (AUT) became the first person ever to compete in nine Olympic Games. In track and field, Marie-José Pérec, the French athlete, won the 200m and successfully defended her 400m title. She became the most successful French female athlete of all time and the first athlete to win the 400m twice. Not to be outdone, Michael Johnson of the US became the first man in Olympic history to run and win both the 200m and 400m. His victory over 200m in 19.32 seconds established a new world record. Turkish weightlifter Naim Suleymanoglu became the first weightlifter in history to win three consecutive Olympic titles. "When he eats at a restaurant, nobody asks him to pay the bill; if he breaks the speed limit, he does not get fined, and the police wish him a pleasant journey," wrote a Turkish journalist. The base of the torch mark logo, made of the five Rings and the number 100, resembles a classical Greek column and recognizes the centennial of the Games. The torch mark's flames gradually evolve into a perfect star symbolizing each athlete's pursuit of excellence. The gold colour in this logo represents gold medals. The green represents laurel branches worn by winners in ancient times, as well as Atlanta's reputation as the City of Trees. Konstantinos “Kostas” Koukodimos, Olympic participant in athletics (1992, 1996, 2000). Muhammad Ali, Olympic participant under the name of Cassius Clay in boxing (1960), gold medallist in Rome 1960. To be able to carry the torch, torchbearers had to be aged 12 or over on 17 April 1996. The torchbearer categories included community heroes, Olympic athletes, Olympic Movement members, and members of the Share the Spirit national and international selection programme run by Coca-Cola. To be considered as a community hero individuals could either nominate themselves or be proposed by others. As part of the application process, an essay of 100 words or fewer describing the qualities of the nominated person was required. The Organising Committee’s main criteria for defining a community hero included notable work as a volunteer, service as a community leader, role model, or mentor, acts of generosity or kindness and, extraordinary feats or accomplishments. Approximately 40,000 candidatures were received from which 5,500 community heroes were chosen. Originally called “Whatizit”, the name Izzy was chosen by 32 American children aged from 7 to 12 from among the following five names: Kirby, Starz, Zack, Gleamer and Izzy. This shortlist was produced from the more than 3,300 suggestions from children in 16 different countries. A product of information technology, Izzy is blue and wears training shoes. The five Olympic rings are in various places around his body. 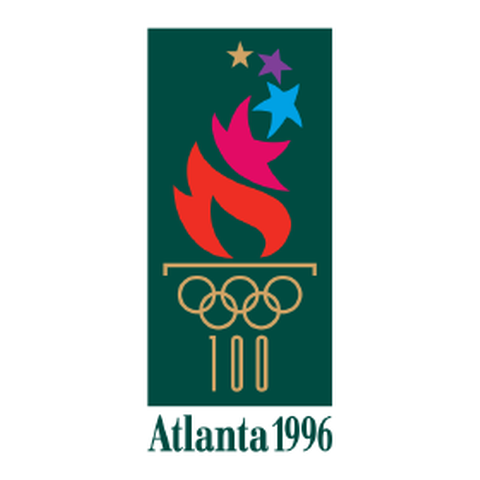 After the Closing Ceremony of the 1992 Games in Barcelona, where he received a mixed reception when first presented, Whatizit was redesigned and renamed by the children of Atlanta. Over time, a mouth appeared where there had first been only lips; stars appeared in his eyes; and his initially skinny legs became more muscled. Finally, a nose grew in the middle of his face. Izzy is an unusual mascot in that he is not an animal, nor a human figure, nor an object. A 30-minute educational cartoon was created and shown throughout the autumn of 1995 on the Cartoon Network channel. To be able to get to the Olympic Games, Izzy had to win the five Olympic rings.